Take a peak at a work-in-progress. Observe the hands of a true craftsman - close attention to every detail. 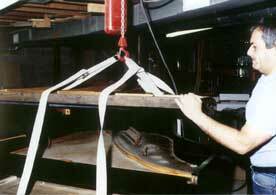 See what happens to your piano during the restoration process. 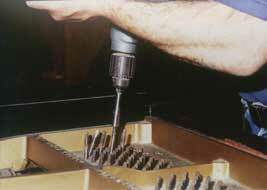 The photographs that follow are an entertaining way to get an inside look into the restoring of a grand piano, and to see what an actual rebuilding shop looks like. The full gallery has six pages, designed to load directly on the page so there's no need to toggle back and forth from a thumbnail view. Please use the Back button in your browser to go to the previous page or click Gallery in the navigation links at the top of each page to return here. The pictures may take a moment to load, but are well worth the minor delay. Enjoy! Please keep your hands inside the ride! In order to install the new, the old must go! not something you'd want to try at home. Strings are under a great amount of tension and must be removed carefully. Out come the tuning pins. Another tedious task that can only be completed with some patience, plus some assistance from the proper tools. Rust can be seen on these pins. 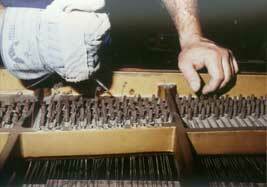 Over time, humidity takes it's toll on many parts of the piano. 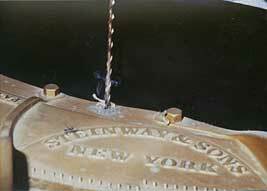 Marking or  indexing the plate prior to removal to insure it returns to the same position. The extremely heavy plate is now removed from the piano and made ready for gilding and hand lettering.